You know how cats like to sit or lie very tightly and neatly tucked? Cosmo is the exception. Most of the time one of his back feet is sticking out, Thumper-style. I keep expecting him to start thump-thump-thumping that leg! It always makes me laugh. Aah...it's his dancing foot. purrr...meow! So cute! Love little Thumper. And Cosmo in his white mittens and boots ~ extra cute! That white foot is so sweet! Make sure you have a video camera handy if he does start thumping! Cosmo, you are the sweetest whited feets kitty ever!!! Cute. I love it too when they sleep in the "bread loaf" position but seem to need to leave one front leg sticking out! 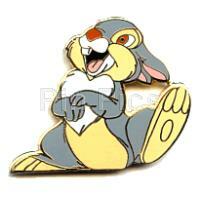 How funny...yes it does remind me of thumper!! Ha ha! I had a cat that did that.....but he had an old injury to his thigh muscle. He walked like it, too! LOL, aww so cute!! He's showing off his lil white socks. Haha I can totally see it!